What functionality do different versions of Harmony offer? S&T Developer enables users to design, validate and communicate S&Ts either from scratch or from customizing generic S&Ts available from the Goldratt S&T library consisting of S&Ts developed and approved for release by Dr. Eli Goldratt OR from the Community S&T Library containing S&Ts developed and shared by a growing Harmony user base. It also contains a Theory of Constraints based Financial model to quantify the impact of all changes on Organizational Sales Revenue, Variable Cost, Operating Expenses and Investment to check if changes are sufficient to meet financial goals. 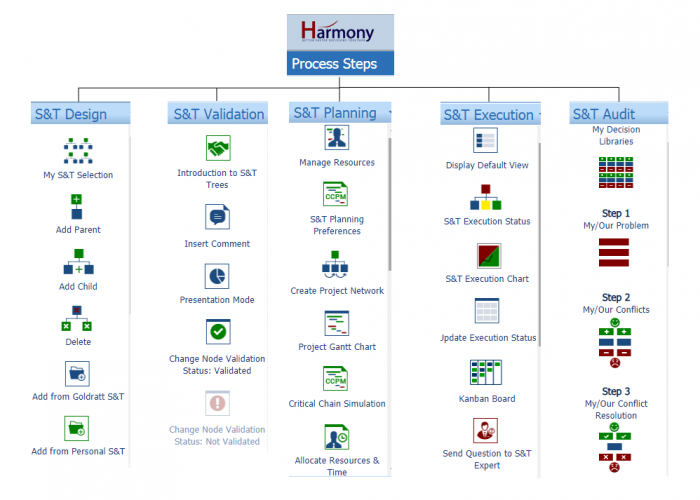 S&T Implementer offers users access to the full functionality of our Harmony software solution, including S&T Design, Validation, Planning, Execution and Audit. The S&T Planning module can be used to allocate Strategy Owners, Tactic Managers and Task participants to each change, to estimate times to achieve each strategy and implement each tactic and create a prioritized project network for execution. The S&T Execution module allows users to update implementation progress and monitor the execution status of an S&T. The Harmony Web App Implementer version also contains new S&T Audit functionality to analyze and resolve planning and execution conflicts and to convert these into “Best practices” that can be added to a library and used to build/customize S&Ts. HARMONY Desktop and Web App contains modules. These 5 modules include the functionality to support S&T Design, S&T Validation, S&T Planning, S&T Execution and S&T Audit (Only Web App).